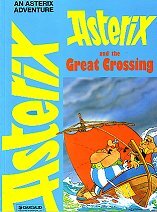 Asterix.com , Official website - English version. Publisher: Dargaud Publishing International. Distributed by Distribooks inc., USA. The Dargaud series was available in the USA. Some of the translations in the series are different from the British version; check the translator (Robert Steven Caron). Below a list of the titles that have been translated by Caron. Year mentioned is copyright of translation.